In a sentence or so: Imagine every morning you wake up twenty years older than you were the day before. You live in a house you don't know, with a man you don't know, with a past you can't remember. This is Christine's life. Christine wakes up every day with no memory of the past twenty years of her life. Her husband, Ben, has to tell her every single day who she is and share enough with her that she understands her situation, without totally freaking her out. Ben has to maintain a delicate balance for Christine and bear unthinkable grief every day. So it makes sense that he doesn't tell her every detail from her life...right? Christine begins to see a doctor who encourages her to keep a secret journal. She records flashes of her memory and they begin to build on each other. As she reads her journal every day, she starts to piece things together. Why doesn't Ben tell her about their past, other than they're married? Is he protecting her...or hiding something? YOU GUYS. I read an adult book. I KNOW. But you know what else? I LOVED IT. The book is described as "Memento on meth", and it totally was. The memory loss mystery is very well done and the suspense is crazy taught. The twists and turns are completely unexpected. Christine is not blameless, which makes her a completely authentic narrator, if often unreliable. If you're looking for a mystery with dark twists and turns and an intensity like whoa, give this one a whirl. You won't want to put it down! Fix er up: Rarely, this fell into a rut with the memory loss and repeating information, but not often enough to deter me from devouring it like a fiend. what prompted you to read this? It's revealed so cleverly too! The beginning of this description sounds so much like that Adam Sandler movie.. that one with Drew Barrymore, 50 first Dates. 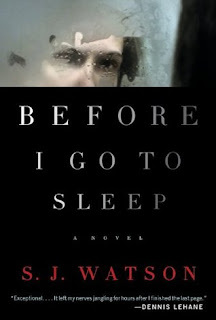 I'm figuring this book is indeed, nothing like that though if it has dark twists. That movie was kinda corny, so without your review, I wouldn't even think to pick it up. I have not seen the movie, but indeed it is nothing near corny. Scary and awesome and rad, yes. Yay for reading an adult book! This never seems to happen anymore in my house... This one does sound kind of awesome though and I may even have to trip over to the adult section of the library to check this one out! It was a surprisingly awesome treat! Congrats on the adult book! And I'm gonna second April's opinion...it does sound a lot like 50 first dates. But more sad, and scary. I FREAKING LOVE MEMENTO. So you think I'll like this book? Sounds like it. Have you read Forgotten? That's another great memory-related book - a YA title, of course. I saw youre reviewing Before I go to sleep, I thought I should shoe you my cult YouTube character Grandpa Joe, who just loves a good story. He has done an online book review of Before I go to Sleep, feel free to use it, share it, or just watch it and enjoy. He has also done other reviews and now is braching out into Grandpa Joe storytimes. I really enjoyed this book as well and I'm glad to hear that you enjoyed it as much as I did. I stayed up WAY too late reading it....I can't wait to read more by this author! Great review!